Happy Friday! I am very happy to announce an exciting giveaway from Lindsay’s Necklaces!!! These beautiful, handmade necklaces are more then just a fashionable piece of jewelry, there is an inspirational story behind them. Click HERE to read how the idea behind these gorgeous, hand crafted necklaces was born. Special thanks to Lindsay for sponsoring this giveaway, and giving one of my loyal followers a chance to own this chic, leopard print necklace!! Would you like to own this necklace?? Simply FOLLOW ME ON FACEBOOK and TWITTER to enter! I will be picking a winner in one week. The winner will be announced on my Facebook page next Friday, April 5th! If you already follow me, leave me a comment below stating how you would wear this necklace! Good luck to everyone, and thanks again to Lindsay for sharing her gorgeous creations! This entry was posted in Giveaway, Jewelry and tagged blog giveaway, giveaway, J Crew, J Crew sweater, Karen Walker number one, Karen Walker sunglasses, leopard, leopard for Spring, Leopard gloves, leopard necklace, Lindsay's Necklaces, Marc Jacobs leather jacket, necklace giveaway, Neon for spring, neon yellow sweater, the fashion minx by thefashionminx. Bookmark the permalink. Wow! I really love this necklace! The other accesories really compliment it well…so chic and easy for everyday! Thanks so much! Leopard is also my fave……bold but also a great neutral! I hope you win! I never thought about wearing leopard with yellow but after seeing your pics… I would wear it with a sunny yellow dress!! I am glad I could inspire you! I am sure that would look gorgeous on you this Spring! love love the necklace! It’s so pretty against the yellow dress. THANK YOU! I think yellow and leopard look great together too! I totally agree! It makes a statement, but it’s neutral at the same time! It would look great on you! Looking fab as always! 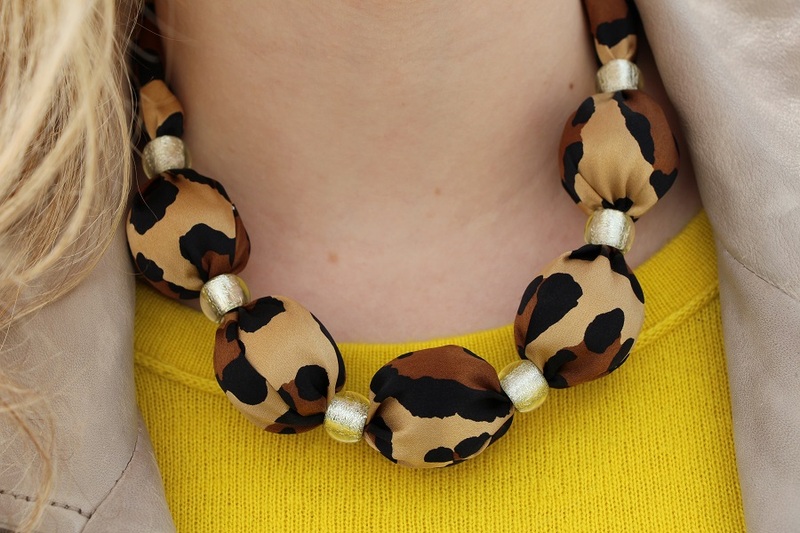 I adore the necklace- leopard print is always my #1 weakness! Haha thank you Abby! Leopard is my weakness too!!! I would wear this necklace with a chic 3/4 sleeve cardigan and some leopard print flats! 🙂 I love animal print too! Oh I love that idea Diana! Never enough leopard print! 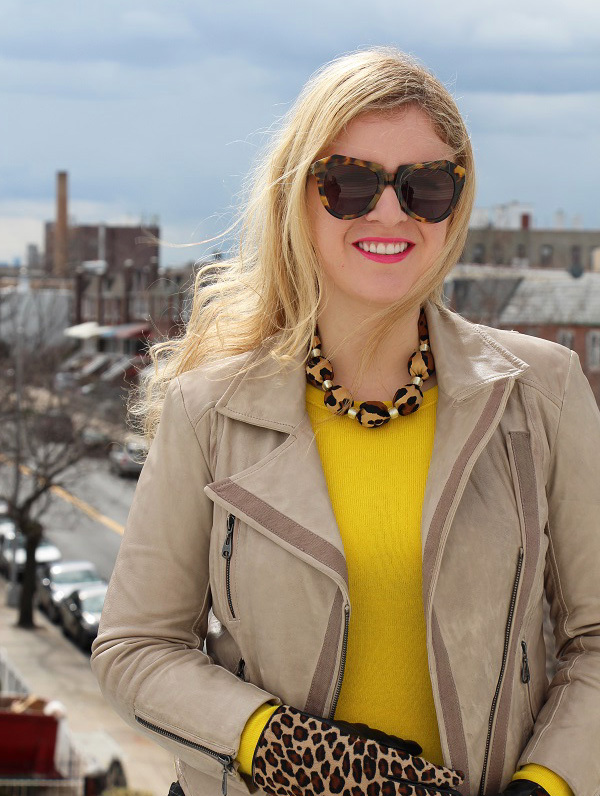 I love the yellow blouse it compliments the neutral tones of the leopard print…edgy!! Thank you! I love bright neon colors with leopard too! This is a really nice statement piece!!! It does look great with the yellow top. Matching gloves are a plus too!! Thank you! I agree, I am surprised how much I love the leopard and yellow together! Super stylish and in! I love the look of the necklace and the entire ensemble! I can definitely see myself wearing this piece! Nice site over here! I’ll just wanna thank you for that. If you like to visit my website check it out! thanks for visiting! Your style is so unique compared to other people I’ve read stuff from. I used to be able to find good information from your articles. Thanks for posting when you’ve got the opportunity, Guess I’ll just bookmark this page. 1 lovely brides’ dresses 2013 fall faves.No amount limited.All orders free shipping.Website:www.lovelybrideshop.com.